Rosemary, I can feel your agony. Rosemary, All I get is misery. She was the best looking girl around. But they could never ever get her down. She was the hottest piece of cake in town. All they ever saw was Betty. They was losers, all around. Always had that je ne sais quoi. 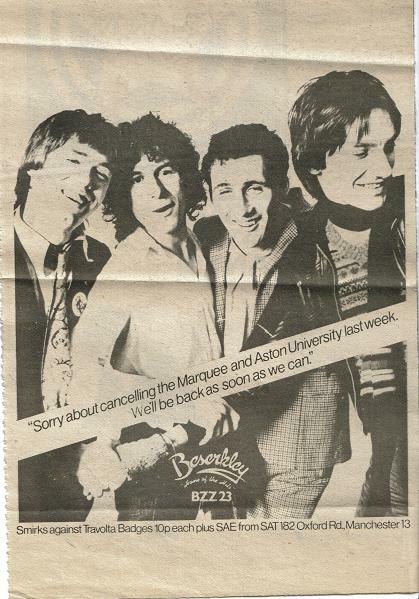 I was just a brash young jerk. All I got was the cold shoulder. She simply said it wouldn't work. When he was naked as a boiled egg. When the lady showed a bit of leg. She didn't want a prat like me. 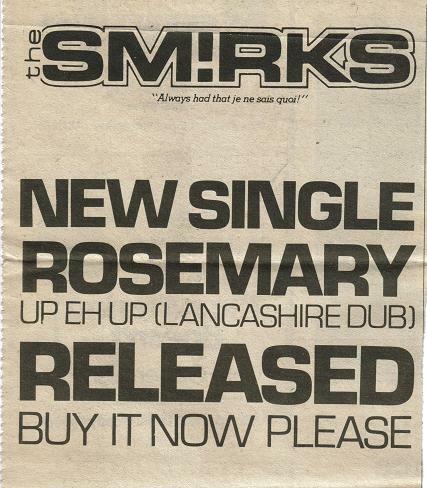 THE SMIRKS: "Rosemary" (Beserkley BZZ 23) Another great pop record, it has a rowdy inventiveness and disrespectful sparkle that is finally missing in the contenders from the Yachts and the Rezillos. Noy only will it get those Doc Martens moving, but it also pokes fun at all sorts of pop clichés, undercutting and revitalising them at the same time. A smart one, fellas. 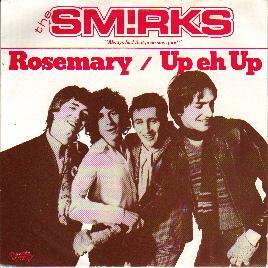 SMIRKS: Rosemary (Beserkley) I get a feeling that this is playing too fast and an impression that they are getting by releasing weak material hoping to get by with an off-beat reputation. 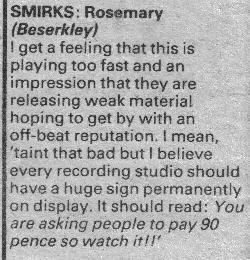 I mean, 'taint that bad but I believe every recoding studio should have a huge sign permanently on display. It should read You are asking people to pay 90 pence so watch it! !